Bob and Sissy Sandburn and their three children had enjoyed a wonderful visit with Bob’s sister’s family in northern Michigan. Unfortunately, on the way back home to Indiana, the Sandburns’ car was struck by an oncoming vehicle driven by a Michigan resident who had a high blood alcohol level. Sissy and Bob each sustained serious bone fractures in the accident; all the children were bruised and traumatized, but their eight-year old son, they learned, had sustained massive internal injuries. Despite having been injured in a terrible accident and being horribly worried about their son’s injuries, Bob and Sissy had remained calm enough to accomplish all the necessary steps after the incident. They’d called the police, sought medical help, gotten information from the other driver, notified their own insurance company, and even remembered to take down the names of witnesses. This accident had been no mere fender bender, however, and the Sandburns understood that their family would probably be facing prolonged negative effects from the accident. In fact, some of the medical professionals who had treated them had tried to prepare them for the fact that the physical damages might prove to be worse than what was originally apparent. Almost right away, the couple was offered a settlement by the other driver’s insurance company. It was tempting to accept the substantial sum of money. But after he’d done some research online, Bob Sandburn realized that if he and Sissy accepted the offer, it might not prove enough to pay for all the medical costs and for their time away from work. By taking the money, they would be giving up all rights to make any future claims. Bob and Sissy made the decision to reject the offer and hire a personal injury attorney. The “wrinkle” they encountered was that Michigan’s auto accident liability laws are different from those in Indiana. Michigan, they learned, is a “no-fault” state, while Indiana is a “fault” state. “No-fault” auto insurance allows policyholders to recover financial losses from their own insurance company, regardless of fault. In “fault” state”, the liability laws hold each driver accountable for his or her role in the accident, assigning a percentage of fault to each driver. Most personal injury cases are filed in state court, usually in the state where the defendant (in this case the Michigan driver) resides. If their case were to end up going to court, the Sandburns would need to travel to Michigan. 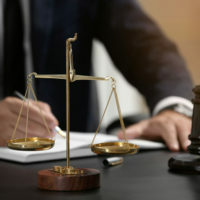 Attorneys can practice law only in states where they took and passed the bar exam, so the Sandburns will need to be sure that, even if their attorney is located in Indiana, he or she is also licensed to practice in Michigan. The Sandburn family had simply wanted to spend some time with family members. Not only had that intoxicated Michigan driver ruined their vacation, the results of the accident would undoubtedly affect them for the rest of their lives. Bob, Sissy, and the children had already been hurt. It will be the job of their personal injury attorney to help recover financial compensation.